“Back From The Dead” will be here on October 12. Skepta first showed his love for Riff Raff back in 2012 when he sampled the Houston rapper's "Versace Python" on his track "Castles" from the Blacklisted mixtape in 2012. The pair have formally united for a new track though and it will be with us on Wednesday, October 12. 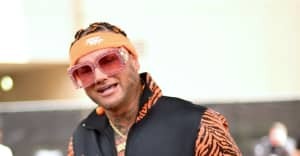 Little is known about "Back From The Dead," though Riff Raff has been teasing a new project Balloween in the last week. "Back From The Dead" represents Skepta's latest collaboration with a U.S.rapper after the Makonnen featuring "Coming Soon." The FADER has reached out to reps for both Skepta and Riff Raff for more information.